The aim of this work package is to support the development for integration of future conventional power plant with renewable power generation. This will be increasingly more necessary as the proportion of renewable power generation increases because conventional power will be needed to react in times of under-supply. Such changes can occur with little warning, such as a drop in sun or wind conditions coinciding with a peak in domestic demand; this has been identified as one of the most significant challenges facing the energy sector in the coming decades. Modern power stations are designed to run under steady conditions, thus significant development is needed to allow them to rapidly ‘load match’ when intermittency arises. Another likely outcome from this scenario is that power stations will need to spend extended periods in ‘standby mode’ (akin to leaving an engine idling) hence there is a need to develop combustion systems that can operate stably and efficiently at low power conditions, with minimal emissions. This research will place Wales in a strong position as a hub for development of technology essential in the support of renewable energy and hence contribute to ensuring security of supply i.e. load matching, as well as enabling reduction in CO2 due to increased renewable utilisation. This activity will be a collaborative research programme focussed on measurement, analysis, industrial impact and dissemination. The key aims will be development of the stability criteria associated with gas turbine combustion processes under transient and standby conditions. This will involve the use of Cardiff University’s Gas Turbine Research Centre to conduct representative experiments that will reproduce the transient conditions, all of which will be agreed in consultation with industry stakeholders. 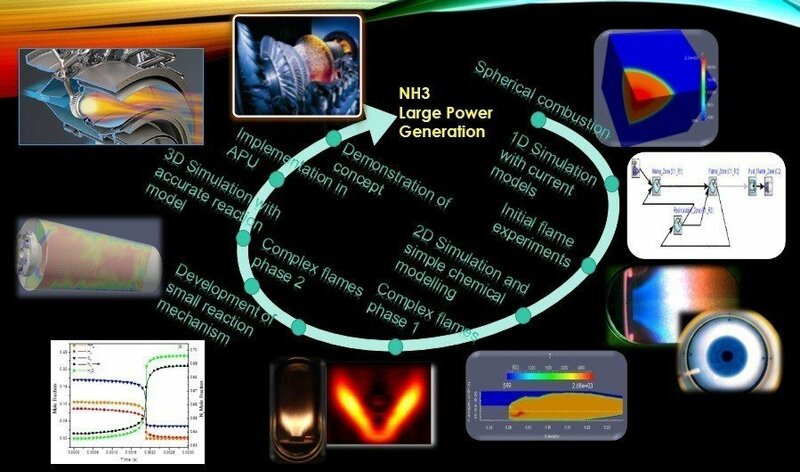 The experiments will study how flame stability, location and emissions are affected at very low powers, plus when engine conditions are changed in a manner currently not advised by designers. Subsequent flow simulation and modelling will allow for the development of design rules and guidelines for the next generation of power plants that can move quickly and safely between operating conditions. 	Develop improved combustion operation/control. 	Develop new diagnostic techniques for identifying and mitigating power-plant regimes of instability. 	Investigate methodologies for improving power-plant efficiencies. 	Explore the potential of novel cycles.